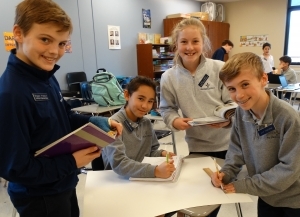 The Villa Values are evident every school day at St. Ursula Villa, where the emphasis on academic excellence and whole child development truly shapes the lives of our children - the leaders of tomorrow. Villa students, partnering with their teachers and parents, set high expectations in all areas of learning and development. Each student's unique talents are nurtured; individual needs are met by a caring staff. Prayer and worship, reflection and service to others are an integral part of the Villa way of life.